With long-awaited arrival of “Julie & Julia” in theaters this month, foodies can’t help but remember the one and only Julia Child, who inspired legions to cook with confidence and daring-do in their own kitchens. I haven’t had the pleasure yet of seeing the movie, though I was fortunate to get a quick peek at a preview clip at this year’s James Beard Awards Gala in New York. Of course, it only left me hungry for more. As a long-time food writer, I had the pleasure of interviewing Julia a number of times. She was always gracious and charming. It was a true pleasure to interact with her in any shape or form. That familiar lilting, bird-like voice never ceased to make me smile every time I heard it. I still have a couple of menus, souvenirs from lunches and dinners hosted in her honor. There’s the one from her 90th birthday party at the Fifth Floor in San Francisco, when illustrious chefs Laurent Gras and Ron Siegel cooked dishes such as “Corn Vichyssoise with Caviar” and “Duck A La Julia Child” to commemorate the grand occasion. 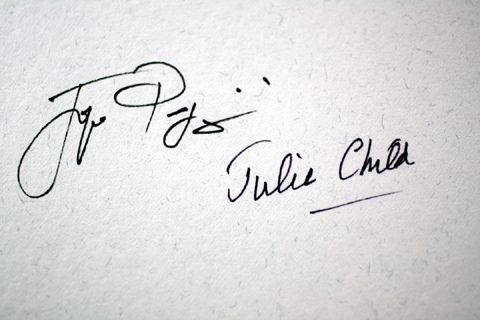 I started leafing through that book, only to realize I had forgotten that both Julia and Jacques had signed the inside page. Her signature was clear and straightforward, much like the woman, herself. 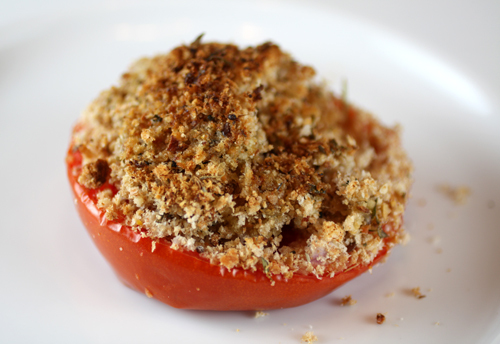 I turned on my oven, and set about making her “Provencal Tomatoes,” the traditional French accompaniment of roasted tomatoes stuffed with herbs and bread crumbs — a true classic just like Julia was. In the book, Julia writes that it’s an especially good dish to make when tomatoes aren’t yet fully in season. The high heat caramelizes the natural sugars, making the tomatoes much more flavorful than they would have been otherwise. I used heirloom tomatoes from the farmers’ market. Because they already have a lovely flavor, the high heat only intensifed their sweetness, making them almost candy-like. 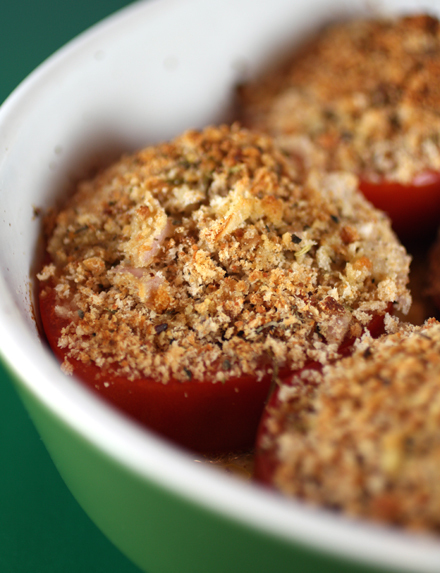 The crisp topping, hiding salty Parmesan cheese, added a wonderful textural contrast to the soft, jammy tomatoes. See the movie, then come home and enjoy this simple dish. It’s one that continues to stand the test of time, just like the woman who loved it so. 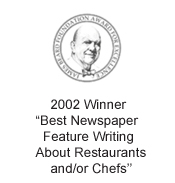 For more of my remembrances of Julia Child, including my first encounter with her when I was just in college, go to ProjectFoodie.com. Set a rack on the upper-middle level and preheat the oven to 400 degrees. Core tomatoes and cut them in half crosswise. Over a plate or bowl, squeeze each half gently to force out seeds and juice (reserve for making stock). With your fingers, clean the cavities of any clinging seeds. Arrange in a shallow baking dish, lightly brushed with olive oil, cut side up. If any halves are wobbly or tilted, trim a bit off the bottom so that they sit flat in the pan. Season with a sprinkling of salt and freshly ground pepper to taste. Stir together bread crumbs, shallots, dried herbs, grated cheese, and chopped parsley in a small bowl. Add 2 or 3 tablespoons of olive oil, tossing well to moisten crumbs evenly. Spoon stuffing into tomato halves, pushing it down into the cavities and mounding on top. Drizzle a scant teaspoon of olive oil over the top of each half. Bake for approximately 20 minutes, or until topping has browned and tomatoes are hot but still keep their shape. Serve hot in the baking dish, or move them carefully to a clean platter. Note: The tomato halves can be stuffed several hours in advance and refrigerated before baking. ah yum, what I love about this move release is that people are remembering the influence this woman had on them and sharing with the rest of the world – it will make seeing the movie (this Saturday) so much richer. What a nice recollection and the recipe looks delicious. The tomatoes look really excellent! I had every intention to go and see the movie last weekend but timing didn’t work out. Perhaps this weekend. Really looking forward to seeing it! A wonderful post! That dish is fantastic! I saw the movie and loved it! I had listened to both audiobooks over the past month, so it was great fun to see both stories combined into one movie. One of the earlier scenes in the movie revolves around tomato bruschetta, which I have been making obsessively, and since I have a lot of tomatoes right now, this looks like another delicious recipe to try. 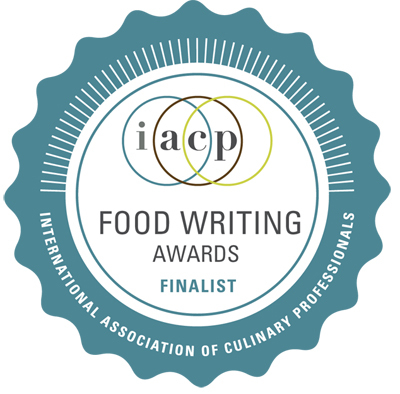 I really enjoyed your story in ProjectFoodie.com – such was the power of Julia Child that, through the many people who were directly inspired by her life and work, she continues to gain new admirers among those of us who are not so familiar with her. I knew who Julia Child was and of her indelible role in culinary history, but I never watched her or read any of her books. However, in reading about others’ personal connections and experiences, as with your story, I now have a strong desire to learn more about this figure who inspires such affection and gratitude. She de-mystified a cuisine without compromising its integrity, quality and authenticity, and as a home cook who is often intimidated by ‘classic techniques’, I would love to learn not only how to master the art of cooking, but to do so with the joie de vivre that Ms. Child so often demonstrated. Thank you for sharing your memories of her and for this simply lovely recipe! 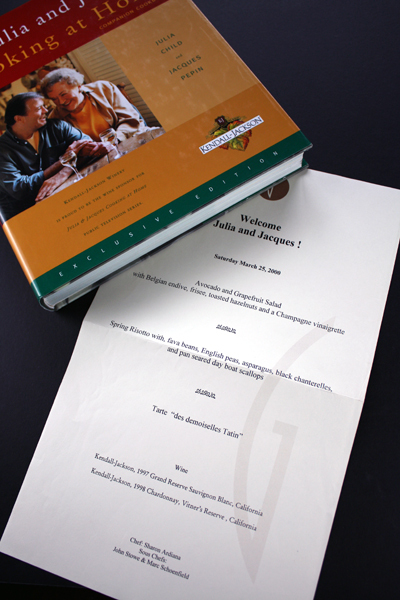 As a food writer, it must have been amazing to have met Julia Child in person! That’s great to have the memories and the mementos. I bet she was really tall! She always looked so imposing. You MUST see the movie. You’ll love it. The tomatoes look fab, by the way! How do you take those gorgeous photos? What camera/lens do you use? Just curious. I’m trying to teach myself how to take food photos… it’s hard! Loved the movie. And along with millions, I too, was inspired by Julia to start cooking. When I read her biography, I realized you are never to old to get yourself into the kitchen and start experimenting. Since she started so late in life it made my late start in the cooking world seem that much more surmountable. Tangled Noodle: I couldn’t have put it better myself. Joie de vivre is exactly what Julia had. I just watched Charlie Rose’s interview with Nora Ephron and Meryl Streep. Meryl used the same phrase to describe Julia, saying she was a woman who lived life to the fullest each and every single day. No doubt it’s a lesson we can all take to heart. Happy Homo Homemaker: I take A LOT of images, hoping at least one will come out half-way decent. I shoot with a digital single-lens reflex camera (DSLR), often with a macro lens. Give yourself time. It’s like anything — the more you do of it, the better you get at it. OMG! I don’t know if I could’ve handled meeting Julia or Jacques Pepin. I would’ve peed in my pants! Carolyn – How lucky you are to have had those opportunities and memories. Thanks so much for sharing in your own charming style! Really a honor and gift-dish to Julia! “… lilting, bird-like voice…” Thanks for a much more flattering description of that part of her charm! 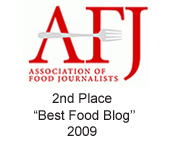 Carolyn, you know that I have been a food public relations person for ages. Strangely when I married my first husband I had exactly five fabulous recipes and if any man was around long enough he got repeat dinners. Except, I fell in love and since he loved food, I also was gifted ( from him) a copy of Julia’s first book. Life was never the same. He was in the news, food and wine business and I became the unimaginable success in wowing everyone. I started with Julia. I might have a hundred cookbooks but I constantly retreat to her. I think she left a mark beyond her greatest imagination. Particularly on my life, which has transpired on to my son. Meeting HER must have been wonderful. I can’t wait to try out this recipe of hers, it sounds delicious. How fortunate you are to have met and interviewed her! Sounds like those are great memories, and this is a lovely summer dish. It’s been too long since I last made stuffed tomatoes. I feel a little silly to admit that I’ve never laid hands on any of her cookbooks, yet I’m sure I encounter her influence on this country’s culinary scene at some level every time I open another cookbook, or eat at a restaurant.